JEGS Universal X-Pipe Kit 2-1/2"
Flowmaster 815932 - Universal X-Pipe Mid-Pipe Kit Diameter: 2.5"
JEGS 30663 - Universal X-Pipe Kit 2-1/2"
The X-pipe design synchronizes the balance of exhaust pulses from each bank of cylinders. This is based on firing order to increase velocity and scavenging from each cylinder. 30661 - JEGS Universal X-Pipe Kits is rated 4.5 out of 5 by 6. Rated 5 out of 5 by mnmoparman from Great value. Way cheaper than the local exhaust shop. I welded the pipes together instead of clamping which took more time but still an easy installation. 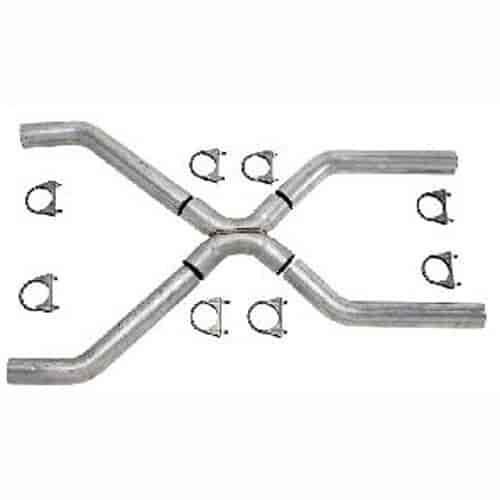 Rated 4 out of 5 by HALIFAXHOPS from gREAT FOR THE PRICE NICE KIT SHOULD FIT MOST WIDTH DUAL EXHAUSTS, ONL DRAWBACK ARE THERE ARE ALOT OF CLAMPS NEEDED AND IT IS RECTIFIED BY WELDING. Rated 4 out of 5 by murderstock88 from very simple Bought the x pipe for my race car and it worked out perfectly instead of using the clamps I welded it all. Clamps not really the best. Good product though! Rated 4 out of 5 by Ross 302 from One size fits all Universal design fit my requirements. Looks good when installed. I welded the joints instead of using supplied clamps. Only wished it was aluminized to match the rest of my exhaust system. THE 30061 KT X-PIPE CENTER SECTION. WHAT IS THE CENTER TO CENTER OF INLET AND OVERALL LENGHT OF CENTER SECTION?